Master Distiller Alan Winchester has been anticipating the release the Vintage 1964 of The Glenlivet Winchester Collection for quite some time. Winchester, whose job was to complete the task started by Bill Smith Grant when he laid down the original casks 50 years ago, talks about his passion for single malt and how losing his chance to get into the Royal Navy as a teenager has been the gain of whisky lovers worldwide ever since. Q. What makes the Vintage 1964 of The Glenlivet Winchester Collection so special? very different place and yet, while everything was going on around them, the casks just sat there with time helping to create the amazing end result which the world will soon have the opportunity to savour. Q. Why is Vintage 1964 of The Glenlivet Winchester Collection a welcome addition to The Glenlivet portfolio? A: It shows the depths of what The Glenlivet can achieve. Only time has helped us create this amazing vintage, as well as sticking to the traditional methods that have been used since the very first bottle of The Glenlivet ever created. Q. Were there any challenges and how did you overcome these? a 20 or 30 year old vintage. Our challenge was to hold off and realise that the wait really would be worth it. And it is. Q. What three words would you use to describe the end result? Q. What are you most proud of with the 50 Year Old? Q. How should those who buy Vintage 1964 of The Glenlivet Winchester Collection look after it? A: My advice is to buy two – drink and enjoy one and keep one for investment! Like all our whiskies, it is a single malt to share with friends. Keep it on display so it prompts conversation – there is so much to tell about the people who created it and the history which is in effect, bottled. You never keep whisky on its side like you do with wine as you need to keep the spirit away from the cork as it will attack the liquid. If the bottle isn’t kept on display, I would suggest keeping it in a cool area away from sunlight. But with this bottle in particular it just has to be seen and admired, not hidden away. Q. You have been in the industry for over 40 years. Where does your passion come from? A: An old schoolteacher, Charles Lamb, inspired me. He always advised to get a job you enjoy and that is exactly what I did. I love whisky, which is obviously important, but I also have a passion for history and understanding how things came about, so my job really is the perfect job for me. Q. What does a typical day for you involve? A: There is no such thing really but, as well as ensuring the quality of the spirit we are producing is the best in the world, there is the usual housekeeping of running a distillery. What is always on my mind is that the casks I am laying down today have to be good enough for someone fifty years in the future. It is a big responsibility, but one which I relish. Once a week we will use our noses to check on the quality of the production. Smell can tell us so much. Q. Can you tell us something interesting about your work that we wouldn’t know? A: We never taste while we are working…I would not get much work done if I tasted it all the time! Q. What advice can you give those aspiring to get into your line of work? A: I fell into it after not being able to get into the Navy. Learning the industry from the bottom up, combined with all the key distilling qualifications, just fuelled my passion for the work. You have to study the science behind creating the perfect spirit, but you also need to combine it with understanding how the process works on the ground. Q. What is your proudest achievement at The Glenlivet? A: It has to be being made Master Distiller in 2009. It was a huge honour. Q. What does pioneering spirit mean to you? A: I am not just saying this because of my links with The Glenlivet but, to me, George Smith was the embodiment of pioneering spirit. He was the first one to take out a distilling licence in 1824 and it was a risk because his neighbours who were making whisky illegally were not happy about someone going “legit”. His son then went on to court to protect the name, which was also a first in terms of copyright. But it was typical of the Smith family. They were the first to bring electricity into the process and the first to see the potential of the railway to get goods to market. After the war, Smith-Grant even targeted the USA as it came out of prohibition, which is probably why The Glenlivet is so popular in America today. Every generation of the Smith family had another pioneer. It must have been in the blood. A: It’s about the stories and the passion behind something, and the quality that guarantees. It is also about really understanding where something has come from. Take The Glenlivet – you can only get it from here in Speyside, nowhere else. 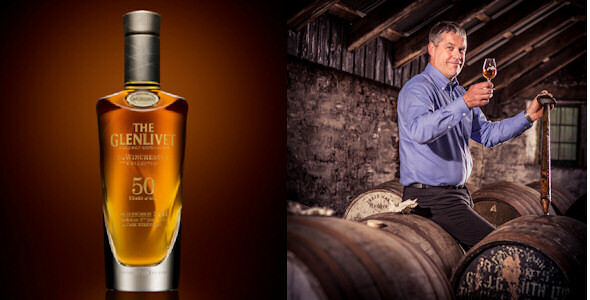 Q: How has life changed at The Glenlivet since the casks were laid down 50 years ago? A: Of course the operation has expanded and while the stills used to be heated by coal they are now heated by clean natural gas. But the process of creating The Glenlivet has remained the same, which is what makes it so very special. Q: What next for The Glenlivet? A: Vintage 1964 is the first release from The Winchester Collection but there is so much more to come. We will continue to keep looking at how we can excite single malt lovers around the world with more 50 year old releases to add to the Collection. We may use traditional methods that are nearly 200 years old, but we also have a passion to keep innovating, to keep exciting whisky lovers and to continue to entice the next generation of whisky lovers.